This feature implements a dynamic field of the type Web Service. This feature implements a generic dynamic field type that gathers its selectable options from an external system using a web service. The response from the external system defines the possible options to be displayed, and they could vary depending on the data that is sent in the request. Normally when a field is changed in a screen (e.g. the ticket priority in the New phone ticket screen) the values of other fields could be updated. That is the case with this type of dynamic fields, as they could also include all screen field values in the request and the remote server could potentially return completely different values depending on input. Additionally if the dynamic field source object already exists (e.g. a ticket, and the field is set in the Free Fields screen), the details of the already created ticket are also included in the request. To create a new web service dynamic field it is necessary to have already a working web service, it requires to have at least one invoker of the type Generic::PassThrough. This invoker will be called to fetch the data from the remote server. The original data that it is sent in a request is similar to the following example. The Form section contains the fields in the current form in the web browser. This information changes as the screen is filled in. Ticket section (or another source object, e.g. CustomerUser), contains the attributes of the object where the dynamic field belongs. For example in New phone ticket screen the section is empty as the ticket is not created yet, but in Free Fields screen it contains the information of the current ticket. DynamicField section contains all non empty values of all configured dynamic fields for the current object. In most cases the data that the remote server requires will be very different from the data provided, so it is highly recommended to use a mapping module for the outgoing data, to format it specifically for the remote server call. The following example shows an XSLT mapping that discards any data and sets a fixed UserLogin, Password and TicketID (as needed for a TicketGet operation). The response from the server can also be very different, so in this case is also very recommended to use a mapping module for the incoming data in order to be able to process the information. The response must be a list of Key and Value elements. 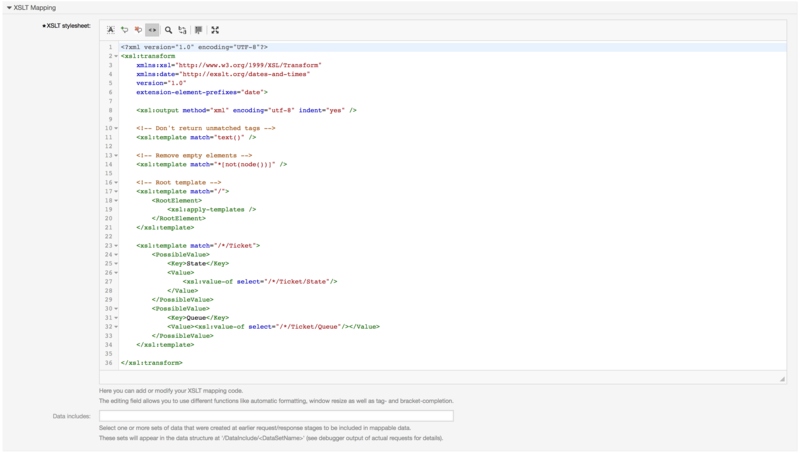 The following example shows an XSLT mapping that converts the results from a TicketGet operation response form the remote server, extracting and formatting the state and queue as needed to be used as options for the dynamic field. The following web service definition (importable YAML file) can be used for testing the field, but the endpoint must be adapted to match current system. This web service acts as requester and provider and it always returns the State and Queue from TicketID 1, as possible values to the field. Description: Get possible values from the other side. \   extension-element-prefixes=\"date\">\r\n    \r\n    <xsl:output method=\"xml\"
\   <!-- Remove empty elements -->\r\n    <xsl:template match=\"*[not(node())]\"
After the proper configuration of web services, it is possible to configure dynamic fields, that use such web services. Below is a description of the dynamic field options. The configured web service whose invokers will be to triggered when a dynamic field is displayed. The invoker that is used to send requests to external systems. Within this field, just invokers of type Generic::PassThrough will be displayed. A drop-down menu to determine if the displayed dynamic field should act as a multi-select field, instead of a drop-down field. A cache time to live value, that contains a value (in minutes). If the value is 0 or empty, no caching will be active. This cache is to prevent unnecessary requests to the remote server using the same values. Defines if it is possible to save an empty value in the field. This option activates the tree view of possible values, if they are supplied in the correct format. Defines if the displayed possible values will be translated to the current user language. Dynamic fields of type Web Service have to be activated for the several masks in which they should be displayed like the other types of dynamic fields. The following covers the cases for ticket based dynamic fields. This can be done through Admin → Administration Overview → System Configuration, then navigate to Frontend → Agent → View. TicketZoom for the ticket zoom view. TicketPhoneNew for new phone tickets. TicketEmailNew for new email tickets. The dynamic field can be added if there exists an entry called Ticket::Frontend::AgentTicket*###DynamicField. This configuration defines which dynamic fields should be displayed in this view. To add a dynamic field, the internal name of the field has to be filled in the first field. After confirmation a second field is filled with the display option. Choose 1 - Enabled to just show the field or 2 - Enabled and required to make it mandatory. The use of the Web Service dynamic field is similar to other dynamic fields like Dropdown or Multiselect, but users could expect to have different options to choose even without active ACLs due to the change of parameters in the web request as other fields are changed.